The rocket that returns to its launch site! The idea of flying a “spaceship” many times over into space has grabbed the imagination of kids and adults alike for decades. The NASA Space Shuttle first flew in 1984 with the idea it would “shuttle” astronauts between earth and space on a weekly basis. But the reality of flying to space many times over proved to be more complicated and expensive than we had hoped. A typical “shuttle” mission could cost up to $1 Billion US dollars. So what is a better way to use at least part of a space launch system many times over? All space launch systems are “staged”. In a typical rocket shown in Figure 1, the first stage or “booster” lifts and accelerates the upper stages until its fuel runs out. The second stage then fires, leaving the booster behind. It can then accelerate more quickly without the dead weight of the booster hanging around. Once the second stage is out of fuel, the same thing happens again with the second stage now left behind. The third stage then takes over. In the end it’s only the payload that ever attains the incredible velocity of 7.8 km/s needed to stay in orbit around the earth. As explained by Vintagespace, “staging is just a clever way of getting rid of dead weight when you are doing something complicated like putting a payload into space”. If we want to start to think about flying at least a part of our space launch system many times over there are two good reasons to start with the booster. First of all, it is discarded first, so it attains the lowest velocity of all the stages; and secondly, it is the biggest and therefore most expensive piece of a space launch system. SpaceX have begun to reuse their 1st stage boosters. We have all seen their spectacular landings on floating launch pads many of hundreds of kilometres “down-range” of the launch site. These landings have been achieved by a very complex manoeuvre involving continued use of the rocket motor. But what about using the atmosphere of the earth for the slow down? What about using wings to “fly” all the way back to the launch site? 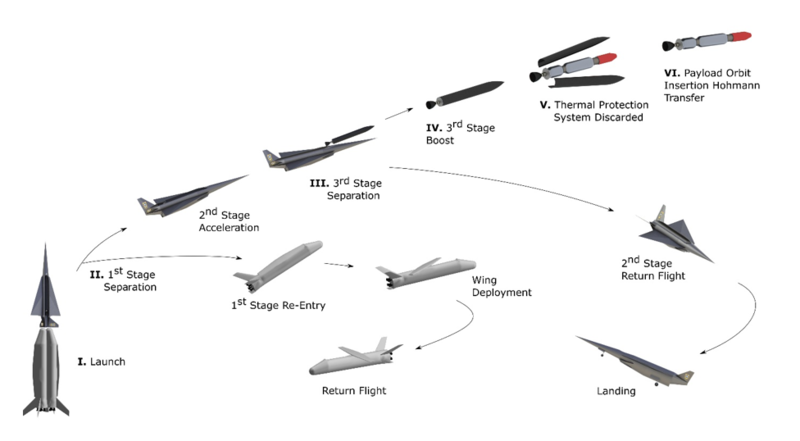 This is what the Hypersonix “Boomerang” boosters are designed to do. 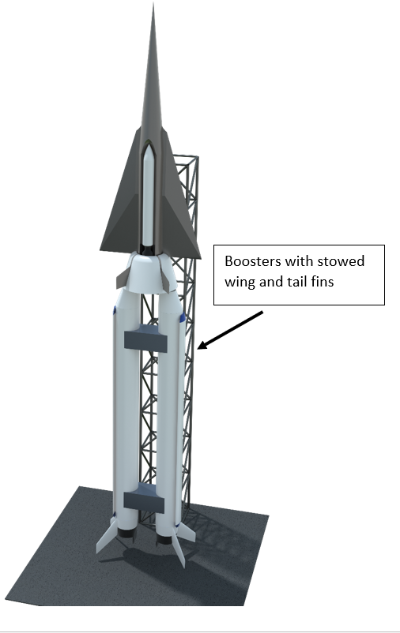 Figure 2 shows a computer generated image of the SPARTAN space launch system. It uses two booster rockets to accelerate the 2nd stage to Mach 5 scramjet take-over speed. But look closely at the boosters. They each have a wing stowed along their backs, and tail fins at their base. These are not used when the booster is doing its job of accelerating the upper stages on their way to space. These “aerodynamic” components are there to enable it to fly back to the launch site. Just like a boomerang returns to the thrower if it is thrown in the right way. Figure 3 shows a schematic of the launch of a small satellite by SPARTAN. Once the boosters have done their job, they each separate and start to fall back to earth. At this point their flight computer uses the tail fins to slow down and re-enter in a controlled way using the earth’s atmosphere. It can’t use its wing just yet, as it’s going way too fast and they would simply break off. However, once the booster has slowed right down to around 150 km/hr, the wing can be swung out. There is also a propeller motor hidden in the nose, which is also deployed. So now the boomerang boosters have turned into small aircraft, which can simply fly back to the launch site and land right next to where they were launched. Fun fact: We get the biggest bang for our buck by reusing the first stage of the rocket, as this is the heaviest component which attains the lowest velocity through the flight. 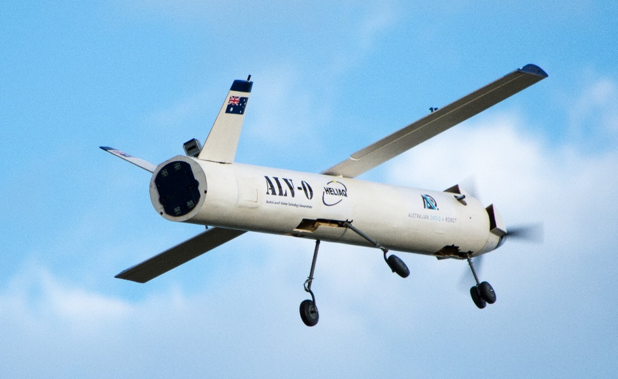 In 2015 the University of Queensland, along with some Brisbane start-up companies, flew a scaled version of the Boomerang booster (Figure 4). These tests, and further flights in 2017 proved that the Boomerang booster can fly once its wing and propeller are deployed. What we now want to do at Hypersonix is a world first re-entry of the boomerang booster from 30 km altitude. And we want the public at large to be a part of it through a crowd funding campaign. Our goal is to do this flight in 2019.
Who wants to come along with us and be a part of space history? Did you like this article? Click here to share it on Facebook!